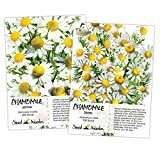 Chamomile plant growing herbaceous of the genus Matricaria or Chamaemelum also known as Camomile or Chamomile, Chamomile plant perennial or annual plant also used as ornamental fragrant plant and also used as medical plant, grow in mediterranean, subtropical or temperate climate and growing in hardiness zone 4-10. Leaves edible the shape narrow 0.2mm wide 1-2 cm long that grow in pinnate structure, the stem is also can be used for beverage. Flower edible the color white the inner part is yellow. 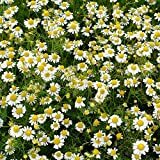 German Chamomile 1600 Garden Seeds Easy Grow Flower Herb Tea #173 Zellajake Farm and Garden.Your Complete Garden Seed Supplier!